Welp, its over, finally. 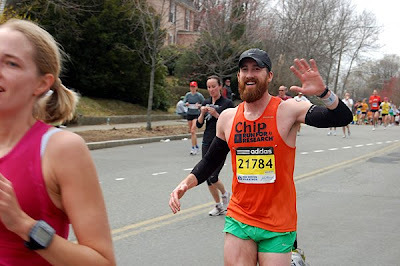 This year, I finished the 113th running of the Boston Marathon in 3:29:31. Not the 3:10 I was going for, but I've got plenty of excuses for that, see the quick list below. But, it was for a great cause, I raised over $3000 for people with liver disease and I completed a marathon, not bad in anybody's book I say. Can't wait to get back to seeing people though, jeez. 2 - The injuries forced me to do 75% of my training on the elliptical machine and 25% on the roads. The elliptical can not prepare you enough to qualify. And I didn't have access to water jogging. Basically, I wasn't in shape to run a 3:10, period, but I lied to myself and told myself I could do it. High hopes. 3 - The crowd was too thick to get out of. This year, the field was it's largest since the 100th running of Boston which in turn made it very difficult to break free of 6 or 7 thousand slow charity runners across just two lanes of road. It was a constant fight, lots of stop and starts, sidewalk/front yard running to finally get to a comfortable pace without other runners cutting you off. This killed my time. 4 - There was a 10mph headwind that just pushed you back, just enough to feel it and pick away at your spirit. 5 - I had the sophmore blues a little bit. There is just something completely amazing and heart bursting about running your first marathon, especially Boston, and especially in the sun with hundreds of thousands of people screaming your name. I just didn't have the fire in my belly like last year. Whaaaaa, cry baby, right? RIGHT. I'm actually pretty pumped I ran another Boston, and hope to maybe qualify in the future. I wanted to thank all my super generous friends and family who donated to make this goal possible, you guys rock, thank you so much.